This time last week, I was sitting around waiting. My pantry was packed, my bar stocked and all my laundry and dishes were cleaned and put away. The backyard was stripped of decorative string lights, the grill was anchored to the deck and the patio furniture was in my dining room. Devices and back up batteries were charged, movies were downloaded to the laptop and a stack of board games and puzzles was waiting in the closet. I was incredibly prepared for Lane to hit Hawaii, marking our first hurricane as homeowners. Except it never happened. At least not for Oahu. The big island of Hawaii and Maui got the majority of the rain and wind, but Lane slowed, weakened and veered away from the rest of the state. We only got gray skies, some gusty winds and barely a sprinkle here. I’m obviously very happy that we didn’t have anything worry about but man, what a weird weekend, waiting for a hurricane to hit and it never showing up. Pestos can be made with any type of herb, even though basil is traditional. I don’t always have pine nuts lying around (which are very expensive), and I have some other nut allergies, so I tend to skip that step with my homemade pestos. I use roasted garlic to fill in a bit for that toasted pine nut flavor. I just whipped up the herbs, garlic, and some fresh parmesan cheese in the food processor with extra virgin olive oil and voila! Easy, nut-free pesto. But you can always get some at the store too. 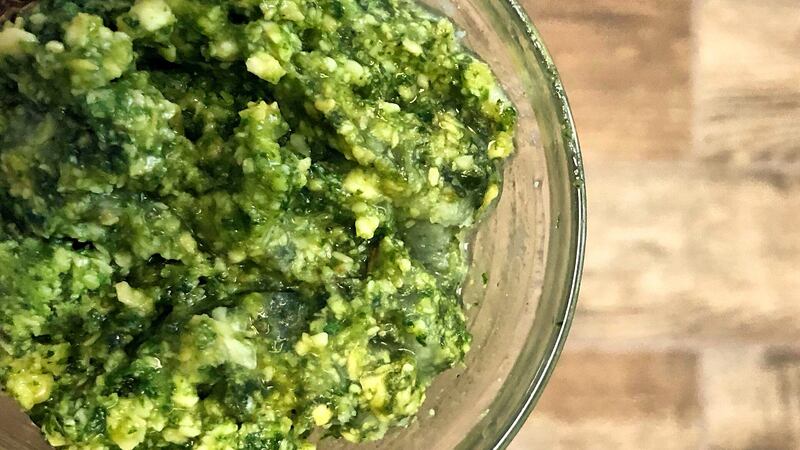 I didn’t record or measure anything while making this pesto, because I figured I would just use it on a sandwich or something when the power was out, which was of course going to happen when hurricane Lane hit. To my surprise, my oven was active all weekend. When I was looking around for things to make and remembered I had this pesto to use, I was inspired to make this recipe. 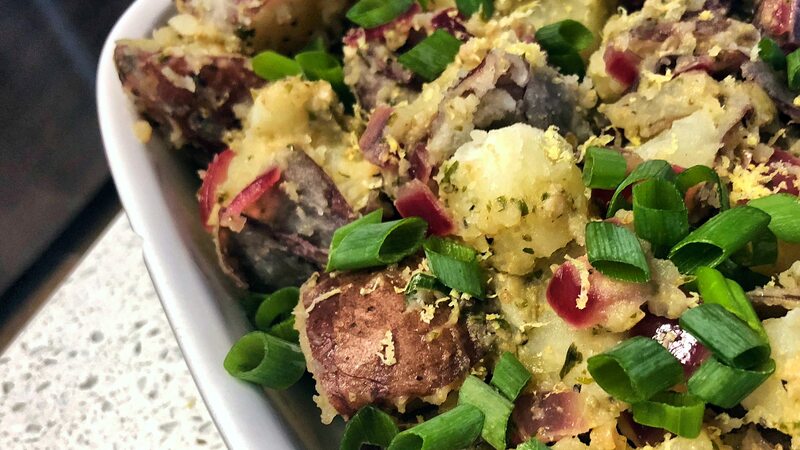 It’s German potato salad with a pesto twist! Place the quartered potatoes in a pot & pour in the stock & water, making sure the potatoes are submerged. Bring it to a boil over medium-high heat, then reduce to a simmer. Cover & cook for 10-15 minutes, until potatoes are fork tender. Gently strain out the liquid, salt & pepper the potatoes, & set aside to cool. Heat a sauté pan over medium heat. 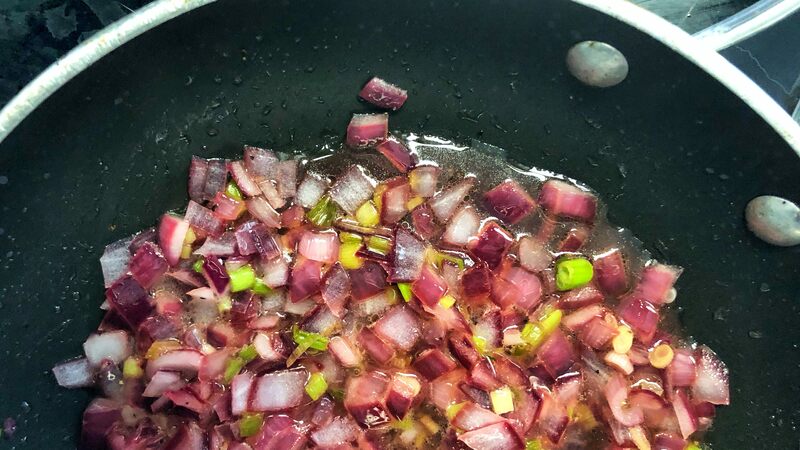 Add the olive oil, red onion & the white & light green parts of the green onion. Cook for 5-10 minutes, stirring consistently just until the onions start to brown. Add the vinegar & lemon juice, reduce the heat to medium-low & let it simmer for a couple minutes. Stir in the pesto, then pour the entire mixture over the potatoes. Gently stir to coat. Transfer to a serving dish & serve warm or at room tempature, garnished with lemon zest & sliced tops of the green onions. Yields about 4 servings. 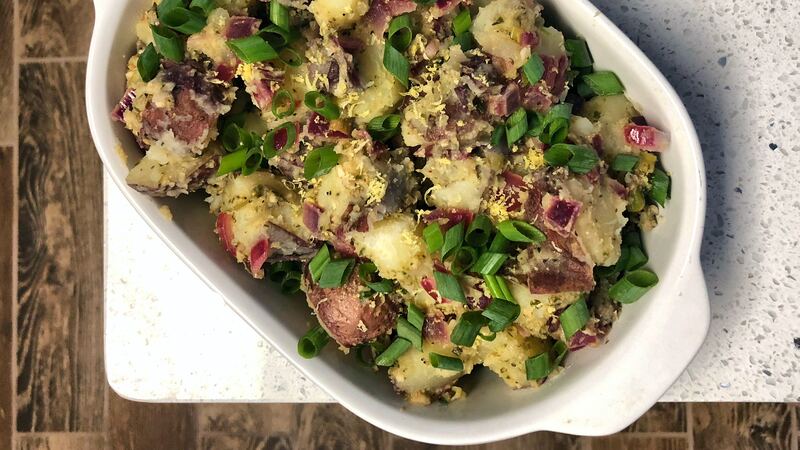 Typically, German potato salad will have bacon and mustard in it, but I used the pesto to take their places. I suppose this is a kind of an Italian-German fusion dish! It’s also a flavor bomb. You get the fresh lemon, the punch of the herbs and the onions and then the tangy vinegar comes in. The soft, cooked potatoes just absorb it all. Speaking of those potatoes, they taste great all on their own because of using the stock. Think about, stock or broth can replace water in a lot of recipes, and all it does is just ramp up the depth of flavor. I like chicken stock, but if you want to keep it strictly vegetarian, veggie stock is great too. This dish can be served really at any temperature, but I like it just above room temp. It would be a great side to bring to a cookout, especially since it’s an easy recipe to double or triple up on. I’m personally not a big fan of mayo-based potato salads, especially when it’s sitting outside all day in the sun. This version is guaranteed to be delicious all day long, no matter how hot or cold it is. Yes, no matter the weather… whether it’s a hurricane or not… sigh.